Aaron Pierre is determined to make the most of the fact his new manager at the Cobblers is a central defender who has played at the very highest level. Keith Curle was a top flight and Premier League player for many years with both Wimbledon and Manchester City, and made three appearances under Graham Taylor for England, with his final game in as a substitute in the Euro 92 draw with Denmark. He also played for the likes of Bristol City, Reading, Wolves and Sheffield United, racking up an impressive 833 senior appearances, so it is clear Curle has a wealth of knowledge to pass on. And Pierre intends to make the very most of it. 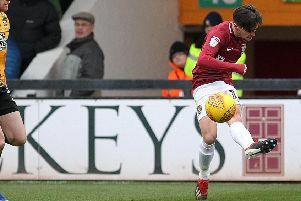 “It’s good that he (Curle) was a centre-half and can give me as much information as he can because he’s played at the highest level,” said Pierre. Pierre has started all three of Curle’s matches in charge to date, and is expected to again line up alongside Shay Facey and Jordan Turnbull in a back three in Saturday’s Sky Bet League Two date with Forest Green Rovers at the PTS Academy Stadium (ko 2pm). It is a new-look defence that has been forced upon Curle thanks to fitness issues for Leon Barnett and Ash Taylor, and Pierre is relishing the challenge - especially as he suddenly finds himself as the senior member of the central defensive unit. It is an extra responsibility he intends to thive on. “Everyone is trying to organise and communicate to make each other’s life easier,” said Pierre when asked how the new defensive unit is settling in together. “The manager knows me a little bit after playing against him against Carlisle, so maybe he’s telling me a lot more to organise because I’m actually the oldest of the back three even though I’m only 25. The Cobblers have yet to lose since Curle took charge, having drawn twice in league two against Bury and Swindon Town and then winning in the Checkatrade Trophy at Oxford United on Tuesday. The next challenge is to claim that first home win of the season, and Town get the chance to do just that on Saturday when Forest Green are the visitors. Mark Cooper’s men are yet to lose this season, and are sixth in the league two table, but Pierre says the mood is good in the Cobblers camp. “We’re very pleased with the current results,” said the former Wycombe Wanderers man.